Influenza virus will cause a respiratory disease that is known as swine flu. Seasonal flu vaccines are available today but they don’t protect against the swine flu, so new swine flu vaccines has been developed . Swine flu is mild in most people. fever, tiredness, cough and sore throat. are the causes of swine flu, it may cause some other symptoms they are headache, aching muscles, chills, sneezing, a runny nose, loss of appetite, vomiting and diarrhea. 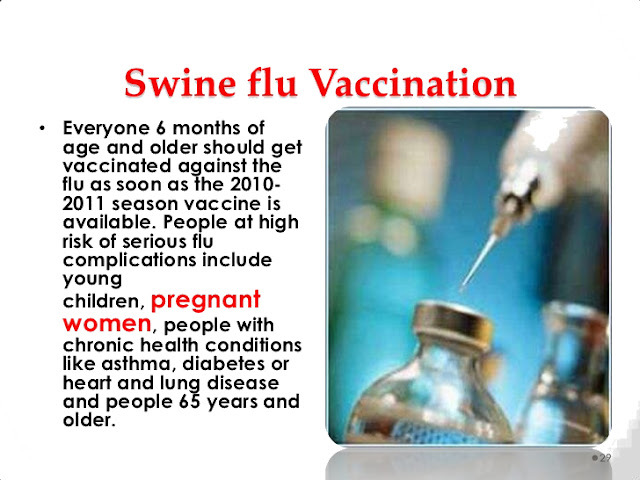 Swine flu vaccine is developed to protect from influenza virus which cause swine flu disease. Pandemrix and Celvapan are two different brands of vaccine. most preferable brand is Pandemrix because it only need one dose. Celvapan vaccine need two doses three week apart. Some people cannot have the swine flu vaccine. The vaccines should not be given to anyone who has have some allergic problems to a previous dose of the vaccine or any component of the vaccine. The vaccine must have the health and social care staff who have a close contact with other people. Children must take this vaccine at correct time.